Arctic Blue Paint - High quality acrylic paints - Easy to use and mix. Thin paint and clean bru.. 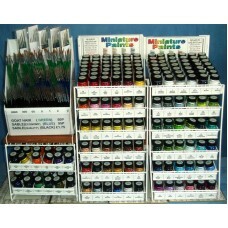 Mid Blue Paint - High quality acrylic paints - Easy to use and mix. Thin paint and clean brushe..
Royal Blue Paint - High quality acrylic paints - Easy to use and mix. Thin paint and clean brus..
Navy Blue Paint - High quality acrylic paints - Easy to use and mix. Thin paint and clean brush..
Porcelain Blue Paint - High quality acrylic paints - Easy to use and mix. Thin paint and clean .. Ocean Blue Paint - High quality acrylic paints - Easy to use and mix. Thin paint and clean brus..
Cyan Paint - High quality acrylic paints - Easy to use and mix. Thin paint and clean brushes with ..
Indigo Paint - High quality acrylic paints - Easy to use and mix. Thin paint and clean brushes ..
Lupin Paint - High quality acrylic paints - Easy to use and mix. Thin paint and clean brushes w..
Matt Varnish - High quality acrylic paints and inks - Easy to use and mix. Thin paint and clean..
Lilac Paint - High quality acrylic paints - Easy to use and mix. Thin paint and clean brushes w..
Violet Paint - High quality acrylic paints - Easy to use and mix. Thin paint and clean brushes ..
Heather Paint - High quality acrylic paints - Easy to use and mix. Thin paint and clean brushes..
33 - Royal Purple Paint - High quality acrylic paints - Easy to use and mix. Thin paint and cle..
Purple Paint - High quality acrylic paints - Easy to use and mix. Thin paint and clean brushes ..